I haven't edited any of my nail art photos, so instead tonight I have a bunch of photos of different polishes I've worn over the last six months. Some my nails are long, some they are shorter, but none have nail art - shock horror. People at work always wonder what is wrong when I don't have nail art on my fingies! Colors by Llarowe - Blonde Ambition. 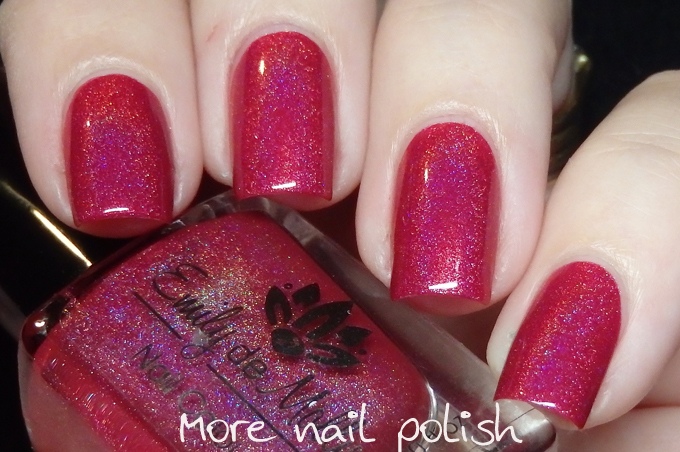 I've shown this before, but it is a colour that I do just love wearing so it's gets out of the helmers a fair bit! Emily de Molly - Claire Bear. Geez, I wore this one ages ago. In fact it was December last year. I remember because I chose this polish to match the suit I wore for a job interview for the role I was acting it. I got the job so I love this polish. Pretty Serious - Daphnie after dark. I had this polish for ages but only wore it two weeks ago. I put this on the night before my son went into the hospital to have his tonsils and adenoids removed. I knew I was going to be in there for a few days, so wanted something sparkly to get me entertained. Pretty Serious - Dragon's Curse. I think I wore this back in about January or February. My nails were shorter and the shimmery gold pastel green was just perfect for the warmer months. The formula on this polish is just superb and the combo of the mint and gold is just so fresh. Crows Toes - Jutunheim. I bought this with the birthday voucher that my bestie local nail gals bought me last birthday from Femme Fatale Cosmetics. This one has to be seen to be believed. 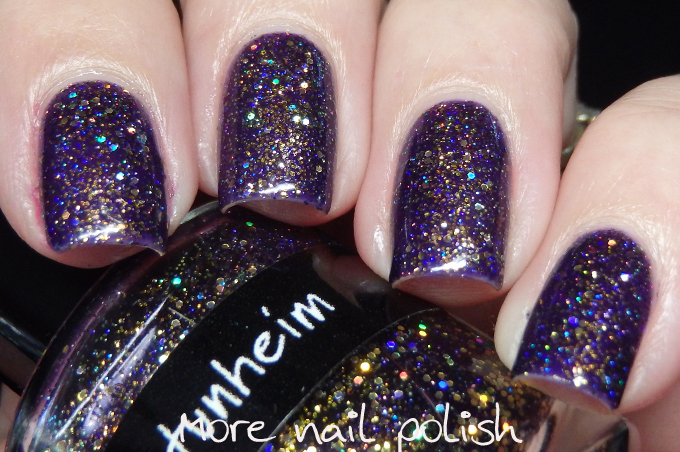 Its a purple jelly with different gold and gold holo glitters. Pretty Serious - Eye of Copernicus. This is just to die for perfection. the glassy smooth deep inky blue base is the perfect opacity to hold the small silver glitters, that glow blue because of the jelly base. This is a perfect starry night look with exactly the right size glitters. I'm so glad I got this instead of the rebooted Essie Starry Starry Nights. 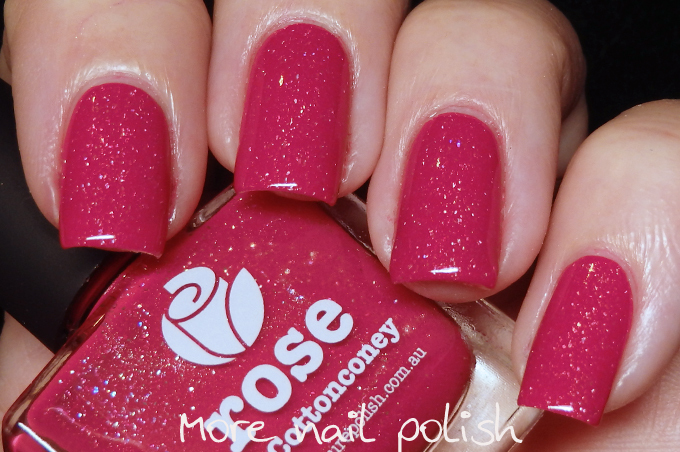 Picture Polish - Rose. This one I wore just last week. Picture Polish just released five new shades and they kindly sent me them all to play with. 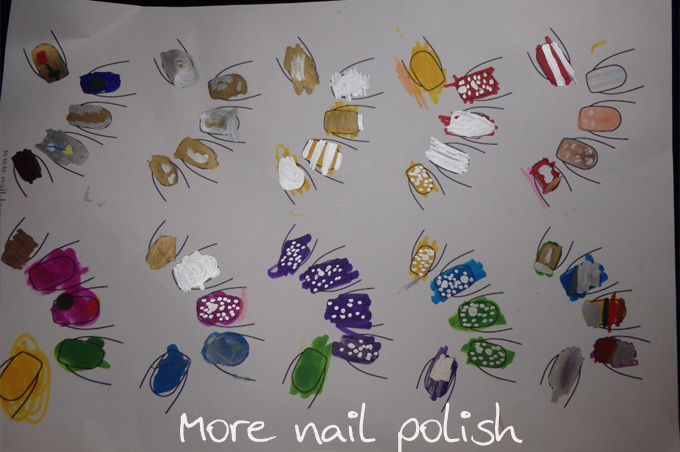 I've got some nail art with this one coming up, but thought I would put the swatch in here with the others. This one isn't nail art, but it sure made me laugh. I've had this for at least a year and have been reaming to post it but never had the reason to. So today I'll just post it without reason. I've have a bunch of these blank nail templates printed out, for when I need to plan out a mani. I found that my daughter had used it as a colouring sheet and used various sharpie pens to create different designs. So adorable! This "colouring book" is very very sweet indeed :) A future nail artist! Your swatches showcase some very pretty polishes - thank you!